I cannot say enough about how great race volunteers can be. They can help motivate you when you're having a rough time, pick you up when you fall, and celebrate with you at the finish line. My initial introduction to racing was actually through volunteering. My dad used to run 5ks every so often when I was in middle school. I volunteered back then, mostly at the water stations, and I loved it. I didn't care much for running, but I had a blast handing out water to the runners, and always treasured my volunteer shirts. 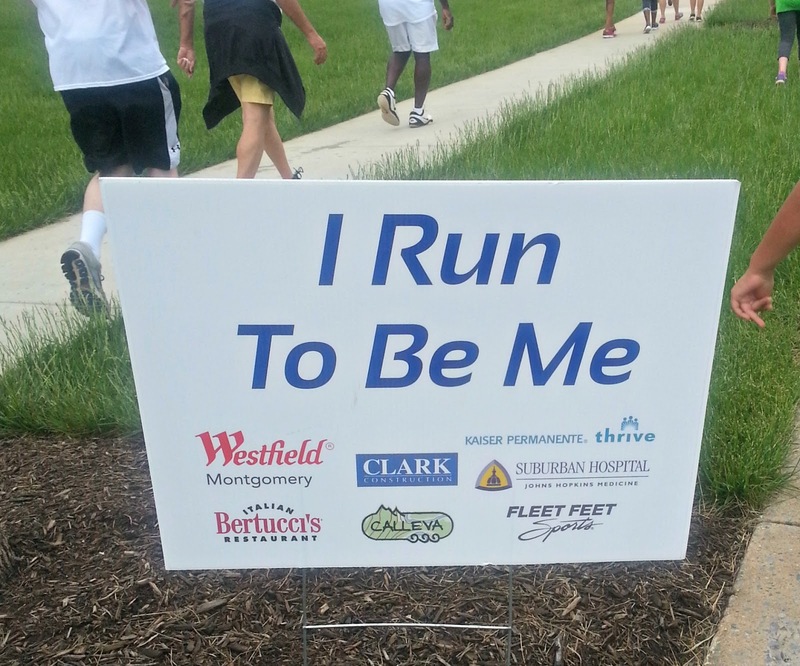 It had been a long time since the my last race volunteer experience, but I fixed that a few weekends ago when I volunteered for the Girls on the Run (GOTR) of Montgomery County 5k. What a wonderful race for a wonderful organization! The girls, 3rd-8th graders, train all semester for a 5k. As such, there is a GOTR 5k in the spring, and one in the fall. The organization works with girls from all backgrounds, which I think is really great. I love organizations that teach young girls about confidence, and the fact that they get to have fun and exercise at the same time is just a bonus! Sports really played a tremendous role in my development. I learned a lot about people, and a ton about myself. 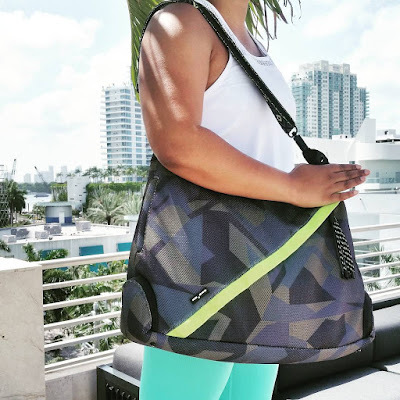 It helped with my confidence, and helped make me the competitive woman I am today. When I met with the Executive Director for something work related, and she described her organization so pridefully to me, I just knew I had to help out! She directed me to the website, where I signed up to be a safety runner in the next race. At the time, I didn't really know what that meant, but it sounded like something where I could be helpful, so there you have it! 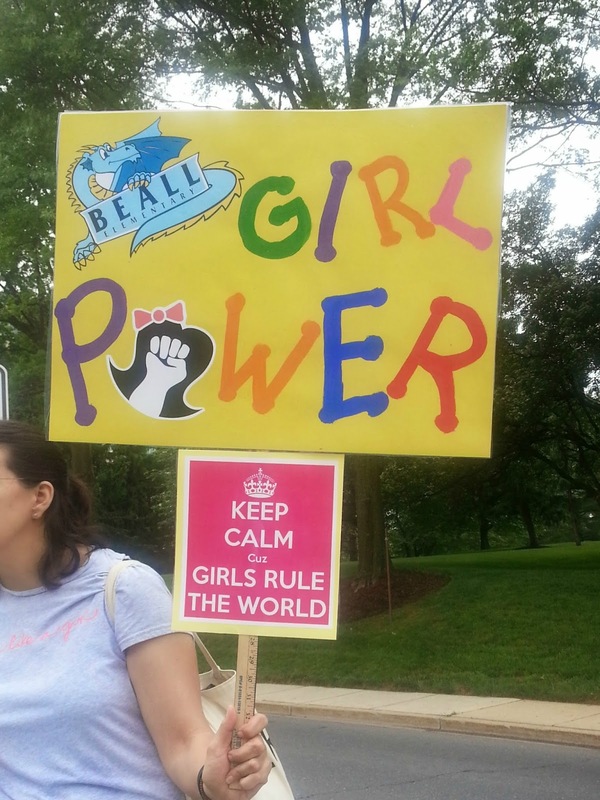 I could go on and on about how great an organization Girls on the Run is, but I really want to use this post to focus on the race itself (especially since it has taken me forever to write this recap!). An organization that has an entire unit on body positivity? 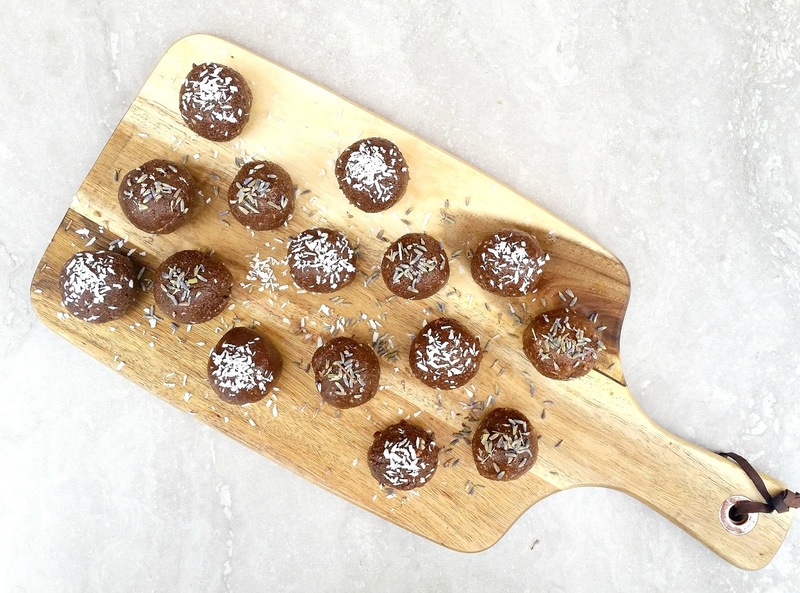 What's not to love?! Okay, sorry. Focus. When I arrived at the race, I was genuinely shocked by how many people turned out. (There were over 6,000 participants from what I was told! Unbelievable!) There were lots and lots of girls who are involved with the program, but I also saw hundreds of families, including grandparents in many cases! The girls wore bright girl shirts, as did their coaches. There were also shirts that said "BUDDY" on the back, and those were for the friends and family members who were running with their girls. 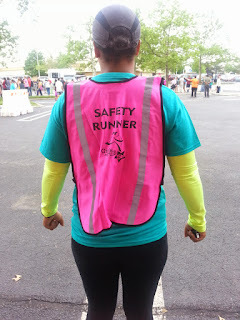 Once I got to the volunteer tent, I was outfitted with a GOTR t-shirt and a bright pink vest that said "Safety Runner." I grabbed my complimentary coffee (a necessity) and muffin, and wandered around the little expo area. Man! There was so much going on! There were at least 10 sponsors exhibiting, and there was a stage where performers were warming the girls and their buddies up with some Zumba. One of the busiest attractions prior to the start of the race was the hairspray station. 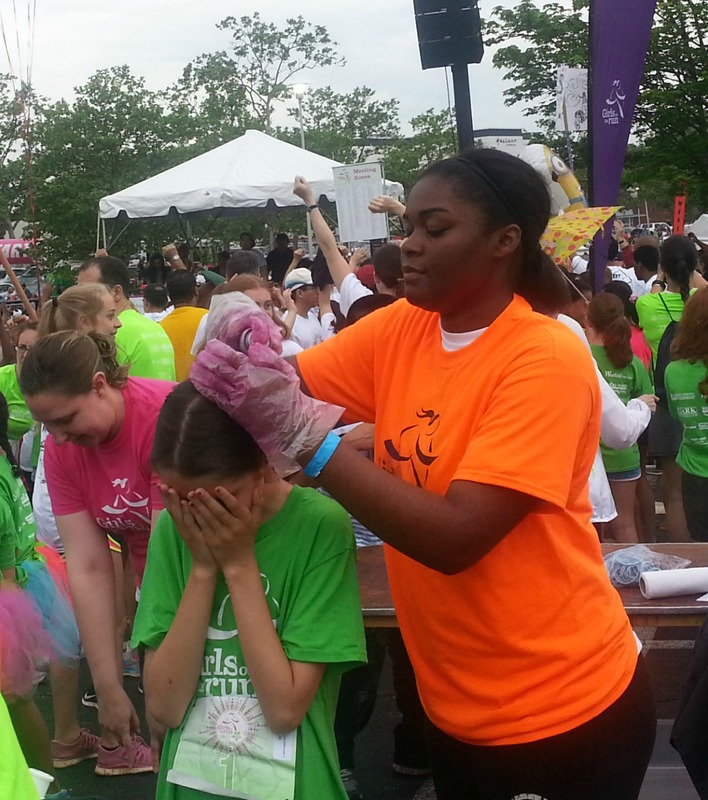 Here, adult volunteers sprayed the girls' hair with pink spray. I saw polka dots, streaks, and a host of other funky styles. How fun! Okay, now on to the race! The race was held at Westfield Montgomery (better known as Montgomery Mall) in Bethesda, Maryland. The course basically had us running a loop around the outside of the mall, to one of the main streets outside of the mall, and back around. I ended up near another safety runner, and we worked out a strategy, since we didn't entirely know what we were doing, despite having received instructions. (Our bad?) We decided to spread out and keep an eye out for each other, in case we needed help. So, what was this whole safety runner business? Basically, all we had to do was jog or walk at a fairly slow pace, and just keep an eye out on everyone. If a girl got separated from her group or her buddy, it was our duty to help reunite them. If anyone got hurt, we were to direct them to the aid volunteers. Other than that dole out high fives and smile and just enjoy the ride! I encountered my first injury right after the first mile. This little girl had taken a pretty nasty spill. Her buddy helped her up, but I came over to make sure everything was okay. The little girl's knee was bleeding, but she was in pretty good spirits. She just wanted to find someone with a band-aid so that she could get to the finish line. I sprinted around the area, turning around occasionally to make sure that I was still able to spot my injured chickadee. Finally, I found someone who could help her out. I wished her the best in the remainder of the race, well wishes for her health, and continued on my way. I gave out a LOT of high fives. I actually think my runners high was super... high? I don't know. I was saying and doing some of the corniest things I might have ever done in my life, and that's really saying something, considering how corny I am in general. (I've never met a dad joke I didn't like!) I was telling everyone they could do it, cheered on some parents, and high fived some more. I was out of control, man. One of my favorite moments was when this one mom was BOOKING it. She was short in stature, and wasn't really wearing athletic gear, but she was trying! And she was purposely trying to leave her daughter in the dust! It was great because the daughter kept giving up, and her mom kept motivating her to push through it. I mean, who wants to lose a race to their mom?! They were having fun and being safe, so I high fived them both (out of control) and cheered them on. They ended up walking a few times, but they were doing their thing and having a blast. And so I continued on. Soon, I accidentally LITERALLY bumped into my friend Susan who coached high school volleyball with me a few years back. She is a GOTR coach at the school where she teaches. She was having so much fun, and so were her girls. We chatted a little bit, and we chose a meeting spot for after the race so we could do a little catching up and take a picture. Then, I was off to do some more safety running. Finally, I met up with my favorite kid of the race. This girl had passed her buddies a while back, and had given up on finding them. She was an older GOTR runner, so she wasn't upset that she lost them. She actually took a little bit of pride in telling me when I stopped and walked with her. This wasn't her first race, but she was loving it anyway. I asked her if she wanted me to run the rest of the way with her. She said yes. At this point, we had just about a mile remaining in the 5k. We ran together. I walked when she did, and encouraged her to run to certain points before she could walk again, sort of how I motivate myself when I feel the urge to walk. Finally, we got to the last stretch. I turned to her and asked, "you think you can run to the finish line?" She shyly smiled and said, "yeah." Together, we crossed the finish line, and I gave her a big high five. "You did it!" Then I went on another high five spree and high fived everybody around me who was crossing the line. I got so distracted by the high fives that I missed out on the last of the bananas. Whoops. The finish line festivities were fun! You could feel the positivity and excitement coming from everyone in the crowd. It was amazing! I had such an amazing time that I'm going to do it again in November! It was so much fun, you guys! Even better, I'm going to be running the Ragnar DC Relay for Girls on the Run in October and raising money for the organization! 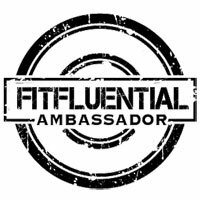 If you are interested in joining me, we still have a couple of spots open on the team. If you're interested in volunteering for the GOTR 5k in November, let me know and I will put you in touch with the volunteer coordinator. You can comment below if you're interested, or email me at lex@flecksoflex.com. I've heard such great things about Girls on the Run - that's so cool you got to volunteer how you did! I'm impressed so many people were in attendance, that's crazy. I love the idea that they are instilling confidence and a positive relationship with exercise and their bodies during an early age. I wish I had had that during that time. It's really a wonderful organization! 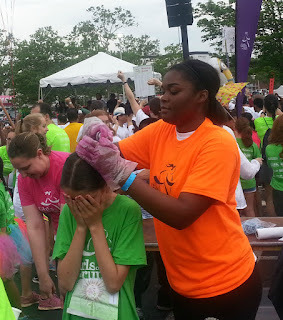 You should look into volunteering at a GOTR race in your area! Awesome recap! 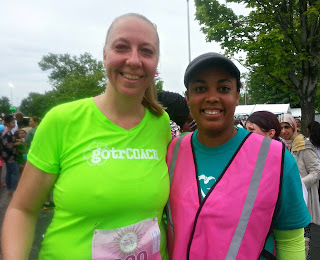 I think we just had a GOTR 5K in Philly last weekend which I unfortunately couldn't attend. I'll have to look into volunteering, because it's such a great cause! Yes to giving young women confidence! You should definitely look into volunteering! It is such an uplifting event! It was so much fun! The girls had a blast, and it was great to see their joy when they crossed the finish line.